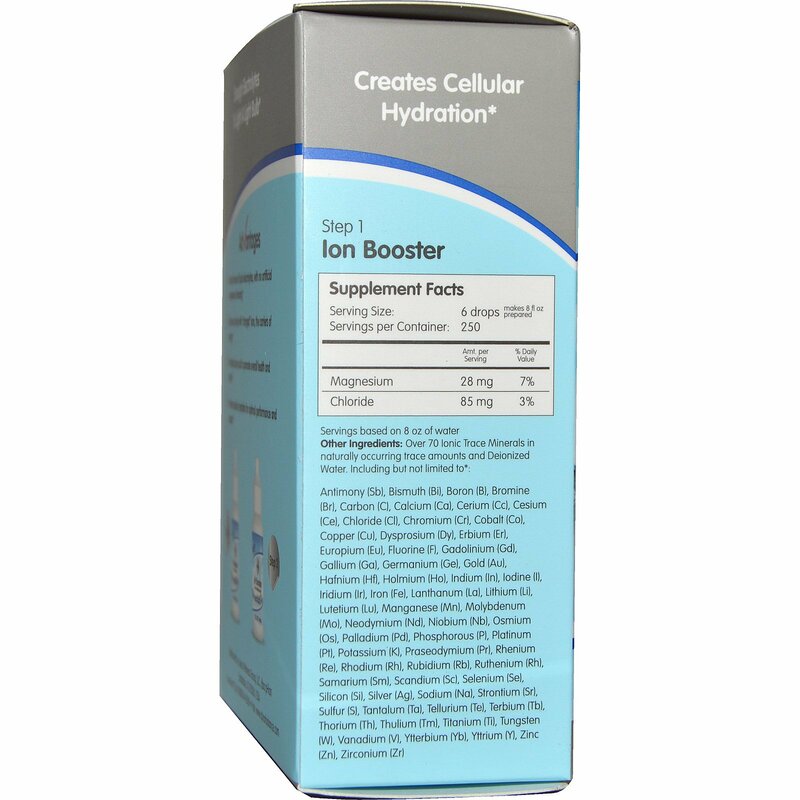 Ion Booster Step 1: Add 6 drops of Step 1 for every 8 ounces of waters, teas or juices that you are infusing. 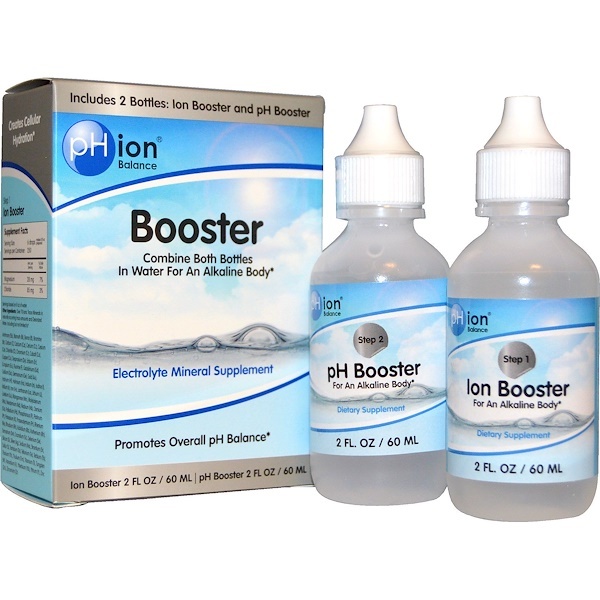 When used as directed, pHion Booster step 1 and step 2 will ionize and alkaline liquids, including bringing the pH of waters to 9.5. pHion suggests drinking 8, 8 oz glasses of fluids every day and combining with a balanced diet and exercise program to achieve health and wellness in your life. pH Booster Step 2: After infusing your liquids with Step 1, add 6 drops of Step 2 for every 8 ounces of waters, teas or juices that you are infusing. When used as directed, pHion Booster step 1 and step 2 will ionize and alkalize liquids, including bringing the pH of waters to 9.5. pHion suggests drinking 8, 8 oz glasses of fluids every day and combining with a balanced diet and exercise program to achieve health and wellness in your life. Antimony (Sb), bismuth (Bi), boron (B), bromine (Br), carbon (C), calcium (Ca), cerium (Ce), cesium (Cs), chloride (Cl), chromium (Cr), cobalt (Co), copper (Cu), dysprosium (Dy), erbium (Er), europium (Eu), fluorine (F), gadolinium (Gd), gallium (Ga), germanium (Ge), gold (Au), hafnium (Hf), holmium (Ho), indium (In), iodine (I), iridium (Ir), iron (Fe), lanthanum (La), lithium (Li), lutetium (Lu), manganese (Mn), molybdenum (Mo), neodymium (Nd), niobium (Nb), osmium (Os), palladium (Pd), phosphorous (P), platinum (Pl), potassium (K), praseodymium (Pr), rhenium (Re), rhodium (Rh), rubidium (Rb), ruthenium (Rh), samarium (Sm), scandium (Sc), selenium (Se), silicon (Si), silver (Ag), sodium (Na), strontium (Sr), sulfur (S), tantalum (Ta), tellurium (Te), terbium (Tb), thorium (Th), thulium (Tm), titanium (Ti) tungsten (W), vanadium (V), ytterbium (Yb), yttrium (Y) zinc (Zn), zirconium (Zr). Step 2 pH Booster: Deionized water. Note: Consult your physician if you are pregnant, nursing, taking medications or have a medical condition. Very alkaline. Must be diluted. Keep out of reach of children. Do not use for eyes. Use as directed. This is a concentrated form. Avoid contact with broken skin, eyes and mucous membranes. If contact occurs, flush generously with cool water. Servings based on 8 oz of water.